We are all excited about the release of The Road Darkens in just a week or two, and the latest article by Caleb over on Fantasy Fight’s website only whet the appetite even more! 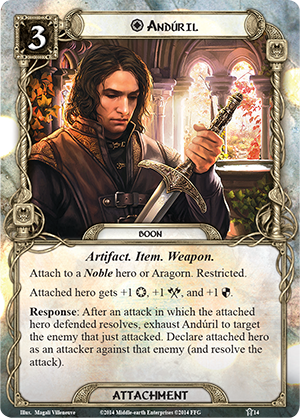 One of the Boons to be included in this epic Saga Expansion is Andúril, Flame of the West, Aragorn’s sword reforged from the shards of Narsil. We all know about the ‘blade that cut the Ring’, but what else is there to know about this weapon before it helps lead the Ring to the Fire when the company goes south? The origins of the blade aren’t entirely clear, but it is believed to have been forged by Telchar the Smith, that great dwarf craftsman of the First Age. From there it was passed down to Elros, son of Eärendil and brother of Elrond, first King of Númenor. Narsil means ‘read and white flame’ in Quenya and its renaming carries on that legacy, as we’ll see. There is no evidence as to how the sword eventually came into the possession of Elendil the Tall, save that his line was distantly related to that of Elros and the line of Kings. Elendil, being one of the great among the Faithful, was shut out by the Kings of Númenor before its downfall and so speculation could say that Narsil was taken early on, as the death cult of Sauron was just beginning, and kept safe by the Elf-friends. Or perhaps it was shunned altogether and dispossessed by an earlier King as an abominable weapon of elvish descent, even if it was originally of dwarf-make. One way or the other, Narsil came to Middle-earth on the wings of storm when Númenor was obliterated and the Faithful fled to Middle-earth in nine ships. From that point on Narsil became one of the more famed blades as Elendil wielded it in the siege of Mordor during the War of the Last Alliance of Elves and Men. Without getting on too tall a soap box, I’ve often felt that the battle between Elendil and Gil-galad and Sauron was a real missed chance for the films. Of course, combat itself is not described in the books but we can imagine a severely epic fight between the High King of the Elves and the High King of Gondor and Arnor on one side against the Dark Lord on the other. In the text it is said that Gil-galad and Elendil defeated Sauron but died in the process, meaning they suffered grievous injury and fell soon after besting the evil one. He, Sauron, did not disappear after having his flanges severed by Isildur. While we aren’t given the details, it’s safe to assume that Sauron was incapacitated and perhaps had even left his physical form behind when Isildur took the broken Sword, split in half when Elendil fell in battle, and cut the Ring off the Black Hand. If he hadn’t floated away yet, surely Sauron’s spirit-self did so after losing the Ring that contained so much of his power and essence. The Sword was salvaged by Ohtar, squire of Isildur, and taken to Rivendell after the disaster at Gladden Fields. From then on the Shards were kept in the house of Elrond as an heirloom of the Rangers of the North. Again, the details are unclear: was it always carried by the Chief Dúnedain, or only Aragorn? Did it stay in Rivendell exclusively? Was one half kept in Rivendell and the other lugged around by the Rangers? However it happened the Sword was kept alive in memory throughout the broken history of the realms of Gondor and Arnor. Even Boromir references it in the dream shared by he and his brother: ‘Seek for the Sword that was broken’. Worth highlighting again is that the Sword That Was Broken did not shatter but was merely split in half. 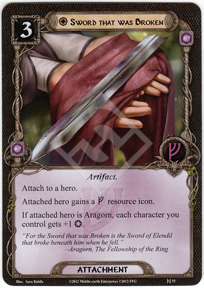 This is clearly represented in the Sword That Was Broken card, as well as core set Aragorn, by John Stanko, in which we see either half the blade being depicted. I find incredibly weird and cool that Aragorn carried around a useless weapon for many years before the sword was reforged. It seems so…Tolkienian. The sword is, of course, used several times during The Fellowship, but it is wielded as a weapon of awe when Aragorn meets Éomer. 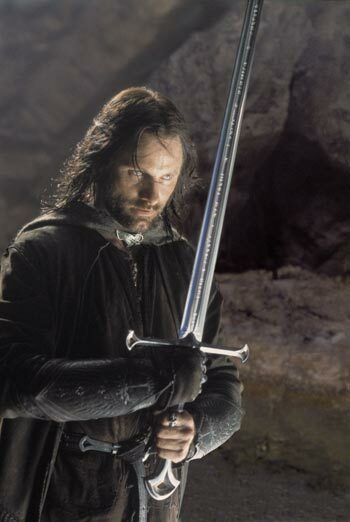 It is both a sword of glorious make and proof of Aragorn’s high lineage. …before all went Aragorn with the Flame of the West, Andúril like a new fire kindled, Narsil re-forged as deadly as of old: and upon his brow was the Star of Elendil. No doubt Anduril shone countless times after that in the wars King Elessar fought alongside King Eomer in the East after the fall of Sauron and surely it was passed on to Eldarion when Elessar’s time came. As a card, Andúril will be epic! The attached hero essentially gets a free attack after he or she defends by exhausting the sword, not to mention a hardy stat boost! I think the designers get to play around with some strong attachments when they are Boons (or, in the case of The Hobbit saga expansions, Treasure) because they won’t be used in regular play. So a card like Andúril gets some special attention and what could potentially be a very strong, even overpowered effect. I’m looking forward to using it and playing through Aragorn’s many adventures! That’s really interesting. I suppose it’s one of those cases of mechanics trumping lore, but I don’t understand why all of Aragorn’s stuff can be attached to anybody. Anduril especially, since in the passage I referenced above he basically says anybody who touches it is going to die. ‘Fitting’ in terms of the story, there’s really no one. Aragorn is so uniquely placed! He’s the fulfillment of all the hopes (Estel) of the Dunedain after many centuries of waiting. No one else, except maybe Elrond, should really wield it. But mechanically, Boromir is a great fit since his readying shenanigans, as you say, mean he will be defending quite often. He’d get an additional attack after the defense step if you chose to ready him, which is epic! Gimli or Eomer might be good fits as well. Great question and thanks for commenting! Another great piece! I think it’s interesting to hear modern complaints about Aragorn’s character as being too two-dimensional, but he wasn’t intended to be some kind of newfangled “complicated protagonist”, he was meant to be a might mythic hero! The card doesn’t seem to say anything about exhausting the character to declare the attack – only Anduril. Am I reading this wrong, or does this mean Aragorn would essentially get two attacks? No, he (or whoever the attached hero is) gets a free attack after he defends. I had to read it a few times because the word ‘attack’ pops up so much, but the response can be triggered ‘after an attack in which the attached hero defended‘. Hope that clarifies! Now that I’ve got the box I’m eager to get a deck going with this shiny blade in it.